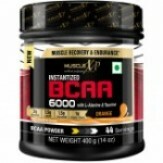 Amazon India is selling Musclexp Instantized Bcaa 6000 With L-Alanine & Taurine - 400G (14 Oz) Orange - 44 Servings Rs. 1234 only at lowest and best price.You can follow the below steps to buy this product at their deal price.Keep Visiting dealsheaven.in for more Best offers ,hot online deals, promo code, coupons and discount . 6 Grams of BCAAs per Serving providing high levels of Leucine to stimulate protein synthesis. Manufactured in World Class International Manufacturing Standards (WHO GMP, ISO 22000 : 2005 from TUV-SUD, Germany, ISO 14001 : 2004 from TUV-SUD, Germany, National Sanitation Foundation (NSF International USA). PLEASE NOTE: MuscleXP Brand is owned by Emmbros Overseas. Across all Online Platforms, the orders are supplied directly by the company and therefore 100% original and does not require any authenticity check. None of the MuscleXP products come with any Printed Foil inside the Box. However, All Jars come with MuscleXP Printed Seal outside the Jar. The product also comes with Scratch Code to Validate Authenticity Check. How to buy Musclexp Instantized Bcaa 6000 With L-Alanine & Taurine - 400G (14 Oz) Orange - 44 Servings?